The Berkshires, located in the western parts of Massachusetts and Connecticut, is both a specific highland geologic region and a broader associated cultural region. The region is also referred to as the Berkshire Hills, Berkshire Mountains, and, with regard to its physiography, Berkshire Plateau. Sir Francis Bernard, the Royal Governor, named the area "Berkshire," to honor his home county in England. Tourism is a principal industry, relying heavily on cultural art attractions and recreation. The Berkshires are the southern continuation of the Green Mountains of Vermont, distinct from them only by their average lower elevation and by virtue of what side of the border they fall on. As a physical geography, the Berkshires extend from the Housatonic River and Hoosic River valleys in western Massachusetts, to the Connecticut River valley in north central Massachusetts, and to the foot of the lower Westfield River valley in south central Massachusetts. In Connecticut, they extend from the upper Houstatonic River valley in the northwest part of the state, south along the western border of the state, east to the Farmington River valley in north central Connecticut, south to the Quinnipiac River valley in central Connecticut, then southwest to the Housatonic River valley in southwest Connecticut. They are on the average 1,000 ft. lower and less prominent than the Green Mountains of Vermont, and form a broad, dissected plateau punctuated by hills and peaks and cut by river valleys. The Berkshires topography gradually diminishes in profile and elevation from west to east and from north to south, except where rivers have cut deep gorges and sharp bluff faces into the Berkshire plateau. The highest point in the Berkshires geology is Crum Hill, 2,841 feet of Monroe, Massachusetts; however, Mount Greylock of the Taconic Mountains, 3,491 ft, the highest point in the state of Massachusetts, is considered the high point of the Berkshires cultural region. Culturally, however, the term "Berkshires" includes all of the highland region in western Massachusetts west of the Connecticut River and lower Westfield River, and all of northwest Connecticut from the Farmington River valley in the northern part of the state in a diagonal arc west to Winsted and Litchfield, then southwest to Lake Candlewood on the New York border and ending in Ridgefield, Connecticut. The cultural region also includes the Taconic Mountains bordering New York, which are geologically distinct from the Berkshires orogeny. Southwest Vermont and the Taconic region of New York are occasionally grouped with the Berkshires cultural region. By the time the ice age retreated some 25,000 years ago, the mountain ranges which enclose the Housatonic, Green and Hoosic River valleys forming “the Berkshires” had worn from near Himalayan size to, for the most part, gently rolling hills. 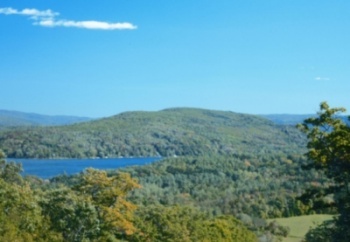 Today this special tri-state area covering western Massachusetts, part of northwestern Connecticut and the New York side of the Taconics attracts many to its bounty of natural beauty, cultural events, recreational amenities and fascinating heritage. The first documented settlement occurred in the mid-1600s when the Mohican Indians moved away from the Iroquois along the Hudson to live in peace at “The place beyond the mountains”, “Questennuck” (Housatonic)*. Not long after, these Indians taught the first white men to settle here how to clear the land of forests and glacial rocks in order to grow basic crops. They also told the secret of tapping maple trees to make syrup and sugar. Others soon followed to this countryside seeking a better life than that offered by the Dutch Patroons of New York State or the British Crown in Boston. The Berkshires soon came to represent a promising land of “free-thinkers”. Important events such as the drafting of the first Declaration of Independence, the demise of the British judicial system in America, the first slave freed under due process of law, the swinging influence for ratification of the U.S. Constitution, the birth of the women’s rights movement in Susan B. Anthony and of the civil rights movement in W.E.B. DuBois…all occurred here. The many rivers of the region invited early industry, Mills of all kinds were built; lumber, grain, cider and spirits, textile, and paper including today’s Rising, Mead, and Crane (where paper for most world currency is still produced). Factories for brooms, buggy whips, axles and shoes; iron and clay mines; marble, granite, limestone and sand quarries…industry fed on abundant raw materials. The Hoosac Tunnel became the engineering feat of the 19th century and opened up an eastern route for railroad export of goods. William Stanley’s alternating current transformer made Gt. Barrington the world’s first town lighted by electricity. The Shakers alone invented hundreds of purposeful items including such “modern conveniences” as the circular saw and the washing machine. Cultural development harks back to 1739 when the Rev. John Sergeant established an Indian school at Stockbridge. Col. Ephraim Williams was killed in the French & Indian war leaving an inheritance to found Williams College. Jonathan Edwards wrote Freedom of the Will. Josh Billings was born in Lanesborough. Henry Ward Beecher, William Cullen Bryant and Fanny Kemble were the first Berkshire literati to promote the beauty of the “American Lake District” or “inland Newport”. Henry David Thoreau, Nathaniel Hawthorne, Herman Melville, Edith Wharton, Oliver Wendell Holmes, James Weldon Johnson and Henry Wadsworth Longfellow were a few of the writing notables who were drawn here. Of course, scores of the wealthy followed to build their “cottages”, mingle with the famous and enjoy the mountain landscapes. Musicians Albert Spalding, Serge Koussevitzky (the first conductor at Tanglewood) and Cole Porter all found harmony in these hills. Artists Ammi Phillips, Daniel Chester French, Henry Hudson Kitson and Normal Rockwell were all inspired to call this colorful place home. Today the hills are alive with the creativity of contemporaries in all fields. Fine history and art museums, superb music and dance festivals, quality live theater, exceptional educational centers…all of these factors and more have combined to complement the wondrous natural environment inviting all to enjoy in all seasons. 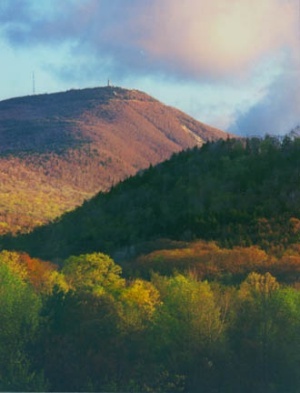 Whether hiking the Appalachian Trail over Massachusetts’ two highest mountains, Greylock and Everett, or exploring the numerous state parks, golfing, skiing, biking country roads, boating, swimming, fishing or just relaxing…the Berkshires are vest for all reasons!